TimipreWolo holds a Bachelor’s Degree in Law and a Masters’ Degree (LL.M.) in Oil & Gas Law, from the University of Aberdeen, Scotland, United Kingdom. Growing up in the oil rich but highly impoverished Niger Delta region of Nigeria, she developed an early interest in finding lasting solutions to the development issues in the region. The loss of her mother at the age of 12 did not stop her from pursuing her educational dreams and became Nigeria’s youth representative to the United Nations Youth Assembly in 2005 and 2006 respectively. 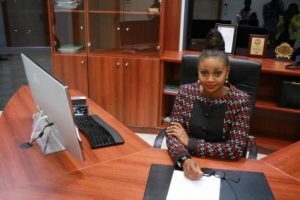 Timipre began her career in private legal practice whilst also running the Greener Nigeria Initiative, an NGO focused on the environment which she co-founded. She later joined the Legal Department of the Petroleum Technology Development Fund (PTDF) in 2010 and was subsequently appointed Special Assistant to the Executive Secretary/CEO. In September 2011, she was assigned the responsibility of driving the PTDF Post Amnesty capacity-building initiative, as the pioneer Head of the Industry Collaboration Unit (ICU) of the PTDF. Driven by her passion and commitment to youth development, while serving in the PTDF, she championed a number of youth empowerment initiatives such as the Youth Entrepreneurship Scheme; the Special Training and Educational Scheme; the Vocational Training Programme and the PTDF pioneer Partnership with the United Nations Institute for Training and Research (UNITAR). These initiatives led to the award of full foreign undergraduate scholarships to young men and women from less privileged backgrounds from the Niger Delta and across Nigeria to study in universities across the globe, including; the USA, the United Kingdom, Norway, China; and Malaysia. Timipre also championed the first ever Helicopter pilot training programme for the petroleum industry in Nigeria with the training of indigenous youths, including 5 females, as internationally certified commercial helicopter pilots to take over opportunities hitherto dominated by Expatriates. Amongst the young budding pilots are Nigeria’s youngest pilot who became an internationally certified commercial helicopter pilot at the age of 18 and the first female commercial helicopter pilot from Katsina State, North-western Nigeria. Following the successful completion of their training, Timipre facilitated the PTDF first ever job-creation partnership with the private sector (an indigenous helicopter services provider for the petroleum industry in Nigeria) to have 15 of the young budding pilots fully engaged/employed, following a type-rating/hour-building internship programme. Listed as one of 90 personalities who inspire Nigeria by an international communication agency, THOSE WHO INSPIRE, Timipre’s service to humanity and leadership excellence has been recognized by the international and local guild. She has received numerous accolades including a “Letter of Recognition” by the Commonwealth Youth Council and the “African Woman of Worth” 2015 Award, by the African Women in Leadership Organization, as well as the Role Model for the Female Child 2016, Award. Drawing from her personal experiences as the youngest member of the male dominated Management of the PTDF and in pursuit of her passion for developing young people, Timipre resigned her very lucrative job as Manager of the PTDF ICU to establish the Centre for Gender Equality, Education and Empowerment, a non-profit organisation focused creating opportunities for young women and girls across the continent of Africa.She is also the CEO of TFN Energy. Timipre also dedicates her time to speaking at conferences and mentoring young women and girls through several platforms, including “ONE HOUR WITH THE KING” a non-denominational Christian Fellowship which she founded in 2013. She enjoys travelling and working with orphanages and Refugee camps. She is a firm believer that education is a vital tool for sustainable development and that with hard work and determination, anything is achievable irrespective of where you come from.